Transform Static Forms: With a single click, you can use the FormTyper? assistant to convert your static forms (no matter how complex) into fillable PDF forms that you can complete, save and email. Easily Compare Documents: With ever changing documents passing through several hands, feel at ease that you can easily compare those documents from their originals. Choose both versions and with a single click this solution will highlight and point out any differences. Scan Directly to PDF: Get one-click scanning to PDF by pre-setting your scanner preferences. Scan and highlight, cross-out, underline or redact – all in a single step. 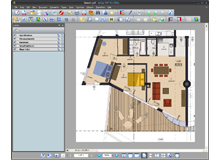 Multi-layer Graphics Management: View, select, merge and flatten layers created by programs like AutoCAD® and Microsoft Visio®. Bring Multimedia to PDF: Embed Flash and Microsoft Silverlight into PDF files to create attention-grabbing multimedia documents – quickly and easily. Listen to your PDF: Instead of reading your multi-page PDF, you can listen to it while working on other tasks. Or you can save it as a WAV file, and listen to it while on the go. Protect Sensitive Documents: Control your PDF documents (viewing, printing and modifications) by adding passwords with secure encryption and permission controls. Or flatten everything in a document to protect sensitive information during file sharing or archival. Accurately convert your PDF files into editable, searchable XPS, Corel® WordPerfect® and Microsoft® Word, Excel® or PowerPoint documents – complete with fully-formatted text, columns, tables and graphics. 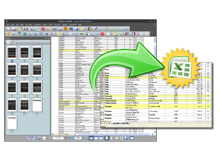 It even lets you combine all pages of a PDF document into a single Excel worksheet. Merge Select Pages from Multiple Source Documents: Combine files and remove or replace pages with drag-and-drop ease. 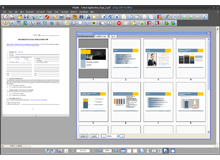 View and select pages from a source document – Word, Excel, PowerPoint, WordPerfect, XPS, JPG, BMP or TIF – to insert into a target document. It makes document assembly faster and simpler than ever. Connect seamlessly to Microsoft® SharePoint® Services v3, Servers 2003, 2007, 2010; Autonomy iManage WorkSite 8.3,8.5; OpenText DocsOpen 4, Connectivity Solutions (eDocs/Hummingbird) 6, 5.2 LiveLink 9.7; and LexisNexis CaseMap 8.5 for enterprise-wide document management from each user’s desktop.